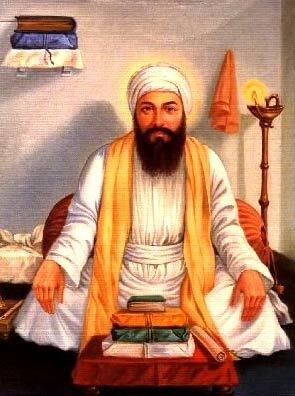 Guru Angad Dev ji was the second Sikh guru appointed by Guru Nanak. Read information on the life of Sikh Guru Angad Dev ji and his contribution towards Sikh Religion. Sikh Guru Angad Dev Ji - Popularly known as Bhai Lahna ji, the second Nanak appointed by Guru Nanak Dev ji him self was born in Harike village in Ferozepur district of Punjab, on March 31, 1504. Bhai Lehna or Guru Angad Sahib ji started worshipping Goddess Durga under the influence of his mother, Mata Ramo ji. He is also believed to having leaded various batches of devotees to the pious temple of goddess Jawalamukhi each year. As a result of ransacking by the Mughal and Baloch militia, the family of Guru Sahib got re settled at village Khadur about 25 kms from Amritsar. It was after he heard Bhai Jodha ji, a devotee of Guru Nanak Sahib reciting a hymn that Bhai Lehna Ji decided to move to Kartarpur to have a glimpse of Guru Nanak Sahib. His very first meeting with Guru Nanak Sahib brought about a complete transformation in him. Thus renouncing the worship of the Goddess, Angad sahib Ji dedicated himself to the service of Guru Nanak Sahib. He got converted into a Sikh and started living at Kartarpur. It was the utter devotion and an astute sense of obedience of Bhai Lehna that saw his being elected as the second Nanak that came after seven years of service to Nanak Sahib. Guru Angad Sahib carried the thoughts of Guru Nanak Sahib both in letter and spirit after his death in 1539. Greatly interested in child education, he strived really hard to increase the literacy rate amongst masses. He also has to his credit the introduction of a new alphabet known as Gurmukhi Script which was a modification of the older Punjabi Script's characters only. Not only mental and spiritual but physical fitness was also of equal importance to Angad Sahib Ji. This becomes evident by a tradition of Mall Akhara, started by him. The very first biography of Guru Nanak Sahib was also compiled by him having collected the facts from Bhai Bala ji. 63 Saloks written by him were also included in Guru Granth Sahib. He also expanded the institution of 'Guru ka Langar' started by Guru Nanak Sahib. Visiting all the religious centers established by Guru Nanak Sahib, Angad Sahib Ji established hundreds of new Sangats that was seen as strengthening the base of Sikhism. A very crucial period for the infant Sikh religion, the period of Angad Sahib ji's Guru ship was the most crucial one. Despite several upheavals and troubles created by the leaders of older religions, Guru Angad Sahib Ji established Sikhism in its own separate religious identity. It was at the mere age of 48 years that he breathed his last on March 29, 1552. But before this, he had already appointed Guru Amar Das Sahib as his successor.